This toilet block management sample community agreement can help define the responsibilities of the different stakeholders in operation and maintenance of WASH facilities from filling up the hand-washing water containers, and keeping the surroundings clean, to providing maintenance. 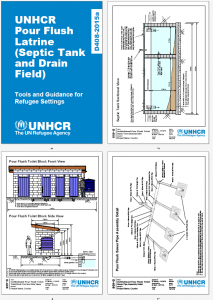 This document contains documentation to help UNHCR and WASH actors build pour flush institutional latrines in refugee settings with septic tanks and drain fields. The package includes: Technical Drawings; Step by Step Construction Drawings; Bills of Quantity; Material and Workmanship Specifications; and Design Calculations. 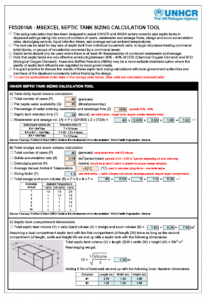 This sizing calculation tool has been designed to assist UNHCR and WASH actors correctly size septic tanks in displaced settings taking into account numbers of users, wastewater and sewage flows, sludge and scum accumulation rates, desludging periods, liquid retention times, and average annual ambient temperatures. Tags: Septic Tanks and Septic Tanks. Categories: WASH Design Guidelines. 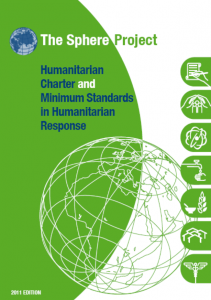 The Sphere Handbook is one of the most widely known and internationally recognized sets of common principles and universal minimum standards for the delivery of quality humanitarian response. Tags: Capacity Building, Disease Vector Control, Drainage, Environment, Gender, Gender Based Violence, Grey Water Disposal, Grey Water Disposal, Household Water Treatment, Human Right to Water / Sanitation, Menstruation Hygiene Management, Piped Water Networks, Protection, Public Health, Solid Waste Management, WASH Coordination, Water Quality Testing and Surveillance, and Water Safety Plans. Organisations: SPHERE. 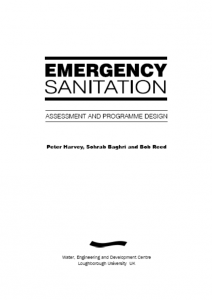 The book Emergency Sanitation: Assessment and programme design has been produced to assist those involved in planning and implementing emergency sanitation programmes. The main focus of the book is a systematic and structured approach to assessment and programme design. It provides a balance between the hardware (technical) and software (socio-cultural, institutional) aspects of sanitation programmes, and links short-term emergency response to long-term sustainability. The book is relevant to a wide range of emergency situations, including both natural and conflict-induced disasters, and open and closed settings. It is suitable for field technicians, engineers and hygiene promoters, as well as staff at agency headquarters. 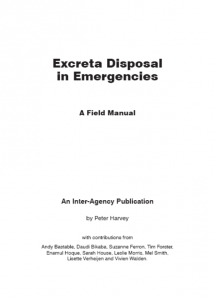 The purpose of the manual is to provide practical guidance on how to select, design, construct and maintain appropriate excreta disposal systems in emergency situations. Relevant situations include natural disasters, relief for refugees and Internally Displaced Persons (IDPs), and complex emergencies, focusing on rural and peri-urban areas. The manual presents a process, which can be followed to assess the current excreta disposal needs and priorities, and to design an appropriate programme to respond to those needs. It can also be used to select appropriate excreta disposal technologies, systems, and hygiene promotion interventions. The manual provides guidance on how to plan, design and construct systems, and how to maintain and promote appropriate use of those systems. Tags: Handwashing with Soap, Handwashing with Soap, Household Toilets, Household Toilets, Hygiene Promotion, and Hygiene Promotion. Organisations: WEDC and WEDC. 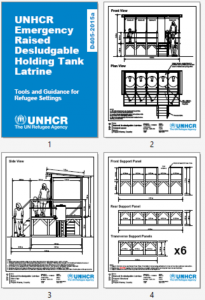 This document contains documentation to help UNHCR and WASH actors build emergency raised desludgable latrines in refugee settings. The package includes: Technical Drawings; Step by Step Construction Drawings; Bills of Quantity; Material and Workmanship Specifications; and Design Calculations. Tags: Desludging and Excreta Transportation, Desludging and Excreta Transportation, Desludging and Excreta Transportation, Desludging and Excreta Transportation, Sewerage and Excreta Conveyance, Sewerage and Excreta Conveyance, and Sewerage and Excreta Conveyance. 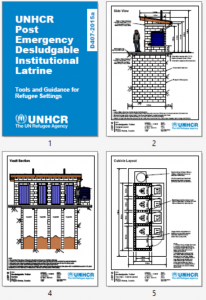 This document contains documentation to help UNHCR and WASH actors build desludgable institutional latrines in refugee settings. The package includes: Technical Drawings; Step by Step Construction Drawings; Bills of Quantity; Material and Workmanship Specifications; and Design Calculations. Tags: Excreta / Urine ReUse, Excreta / Urine ReUse, Excreta Composting, Excreta Composting, Excreta Treatment, Excreta Treatment, Excreta Treatment, Excreta Treatment, and Excreta Treatment. 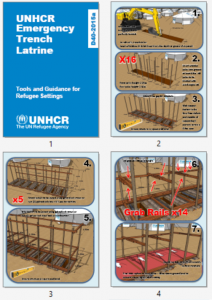 This document contains documentation to help UNHCR and WASH actors install emergency trench latrines (poles and plastic) in refugee settings. The package includes: Technical Drawings; Step by Step Construction Drawings; Bills of Quantity; Material and Workmanship Specifications; and Design Calculations. Tags: Excreta Management, Excreta Management, Excreta Management, Excreta Management, Excreta Management, Excreta Management, Excreta Management, Excreta Management, and Excreta Management. Categories: WASH Emergency Guidelines, WASH Emergency Guidelines, WASH Emergency Guidelines, WASH Technical Designs, WASH Technical Designs, WASH Technical Designs, WASH Technical Designs, and WASH Technical Designs. 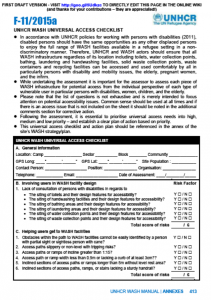 This document has been designed to help UNHCR and WASH actors assess WASH infrastructure for potential access from the individual perspective of each type of vulnerable user in particular persons with disabilities, women, children, and the elderly. Tags: Bathing Facilities, Bathing Facilities, Cross Cutting, Cross Cutting, Cross Cutting, Disability, Disability, Laundering Facilities, Laundering Facilities, WASH Assessments, WASH Assessments, WASH Assessments, WASH Monitoring, WASH Monitoring, WASH Monitoring, WASH Programme Management, WASH Programme Management, WASH Programme Management, WASH Programme Management, WASH Strategy Development, Water Supply, and Water Supply. Languages: English, English, English, English, English, English, English, English, English, and English. Organisations: UNHCR, UNHCR, UNHCR, UNHCR, UNHCR, UNHCR, and UNHCR. 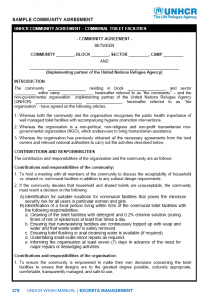 Categories: WASH Blank Forms, WASH Blank Forms, WASH Blank Forms, WASH Operational Guidelines, WASH Policy Guidelines, WASH Reference Documents, WASH Reference Documents, WASH Reference Documents, WASH Reference Documents, WASH Reference Documents, WASH Reference Documents, WASH Reference Documents, WASH Reference Documents, WASH Reference Documents, and WASH Reference Documents.